Second Sentence: To get there you follow Highway 58, going northeast out of the city, and it is a good highway and new. 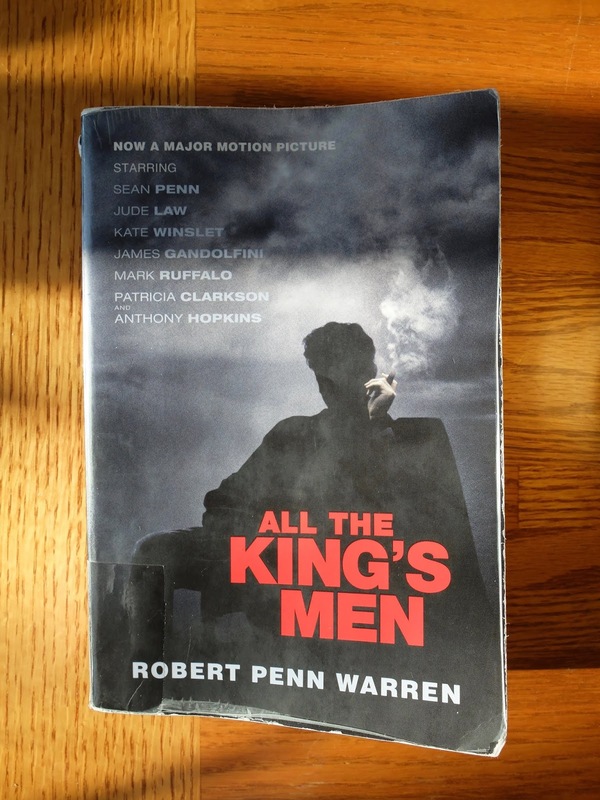 All the King's Men won the Pulitzer Prize in 1947 (70+ years ago! ), and is apparently the Great American Political Novel. Unlike a couple of the other excessively long Great American Novels on The List, I enjoyed this one a lot. (I'm thinking here of The Naked and the Dead and From Here to Eternity, though I should add that both of those books break the "never write a 700 page book" rule, while this one follows it, so perhaps that's the difference.) All the King's Men has a leisurely pace and a feeling of spaciousness I'm not sure I've really encountered before. It's helped along by great prose (author Robert Penn Warren was another Poet Laureate) and characters, but I am getting ahead of myself. Jack Burden was once a reporter, but at the opening of this novel he's working for "The Boss," Willie Stark, governor of [state]. Jack is someone who has never really had much ambition for himself, and therefore enters Willie's orbit. They visit Willie's father, who still lives on the crummy farm where Willie grew up, purely as a photo opportunity. Then, Willie learns that Judge Irwin has announced his support for Willie's rival, and this results in a late night trip to visit Judge Irwin in an effort to intimidate him. It turns out that Irwin is an old acquaintance and perhaps mentor of Jack's. When he refuses to budge, the Boss instructs Jack to dig up whatever dirt he can find on the judge. Eventually the action shifts into the past, where we learn that the manipulative demagogue Boss was once the idealistic young lawyer Willie Stark. There's a lot of other stuff going on. The book is supposedly about Willie but I found that it's much more about Jack. There's a long diversion where he describes the contents of a journal kept by a slave-owning ancestor of his, and also a lot about his love for his childhood friend Adam Stanton's sister, Anne. Of course all of this eventually comes together in various ways as the novel progresses. One thing I didn't particularly enjoy about this book were Jack Burden's adventures with women. There's a lot of generalizing about women's behaviour and basic lack of acknowledgement that women are humans with independent feelings, although oddly enough there are some great female characters in this book. Sadie Burke is the best of them by far: tough as nails on the outside and the rawest nerve on the inside. I loved her. I loved the way Warren wrote about teenage Anne Stanton's body (from the perspective of college-aged Jack Burden) a WHOLE LOT less. The themes of this novel were about a thousand miles over my head, besides the obvious: power corrupts. I even managed to miss Willie's descent—I felt like the novel very much skimmed over his transition from idealist to crook (or perhaps implies that this transition was almost immediate?). He is perhaps based on or inspired by Huey Long, a Louisiana politician, although Warren denied this. I don't know anything about Long, or about American state politics, and am not particularly interested in American politics, so there may have been some context clues there that I completely missed. It's a good time, though. Read it and see for yourself. Not that I much blame Duffy. Duffy was face to face with the margin of mystery where all our calculations collapse, where the stream of time dwindles into the sands of eternity, where the formula fails in the test tube, where chaos and old night hold sway and we hear the laughter in the ether dream. But he didn't know he was, and so he said, "Yeah." He was a lawyer now and it had taken him a long time. It had taken him a long time because he had had to be a lawyer on his terms and in his own way. But that was over. But maybe it had taken him too long. If something takes too long, something happens to you. You become all and only the thing you want and nothing else, for you have paid too much for it, too much in wanting and too much in waiting and too much in getting. In the end they just ask you those crappy little questions. I left Savannah the next day, but not before I had gone out to the cemetery to look at the Carruthers vault, where moss encroached upon the great name and the angel lacked one arm. But that didn't matter, for all the Carrutherses were inside now.